Following KLED: THE REUNION, Kled's champion reveal is out and he is headed to the PBE soon! Continue reading for more information on how Kled and his mount Skaarl work together! "Noxian soldiers say a lot of things about the murderous yordle known as Kled. They claim he's fought in every campaign ever waged by the Noxian legions, acquired every possible military title, and has never once backed down from a fight. These claims, like all stories about folk heroes, are dubious. But one part of Kled's legend is undeniable: when he rides into battle on Skaarl (his cowardly steed), the Cantankerous Cavalier fights ferociously to protect what’s his… and to take whatever he can get. Kled's semi-trusty mount, Skaarl, has its own health bar and takes damage in Kled's place when the two ride together. Any bonus health Kled picks up through items, runes, and masteries also applies to Skaarl. When the lizard's life bar is whittled down to zero, it'll run for the hills, leaving Kled to fight alone. When fighting solo, Kled's abilities change and he gains movement speed while heading toward enemy champions. Kled can restore Skaarl's courage and bring the craven critter back by attacking towers, champions, or epic monsters. Kled throws a literal beartrap tied to a piece of rope, dealing damage to all enemies it passes through and attaching to the first enemy champion hit. If the Cantankerous Cavalier sticks close to the struck target for a couple of seconds, he'll reel in the rope, pulling his hapless target towards him while applying a slow and a decent chunk of damage. This ability deals bonus damage to minions. Kled fires his gun, blasting a wad of bullets in a target direction and knocking himself backward. Kled's basic attacks cause him to frenzy, granting attack speed to his next four basic attacks. The fourth frenzied blow deals bonus damage based on a percentage of the target's max health. Kled and Skaarl dash toward a targeted area, dealing damage to enemies in their path and temporarily gaining a burst of movement speed. If Jousting strikes a champion or large monster, Kled and Skaarl can reactivate the ability to dash back through the struck target, again dealing damage. Kled and Skaarl charge toward a targeted location, building up a shield and boosting the movement speed of allies in their wake. Skaarl will home in on the first enemy encountered, ramming them to deal damage as a percent of the target's max health. Kled needs to go HAM. 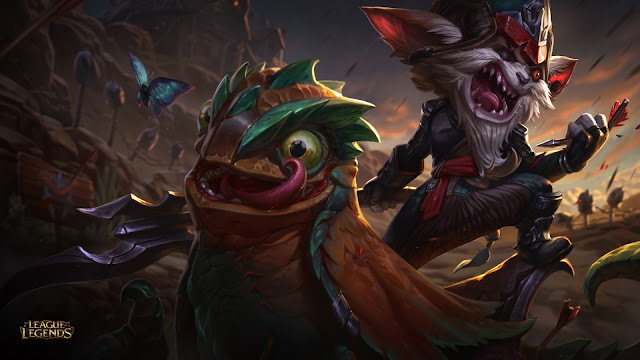 The Cantankerous Cavalier wants only to bring death to his foes, and Skaarl's courage system rewards Kled for sticking through a fight, even after the reptilian steed abandons its manic yordle master. 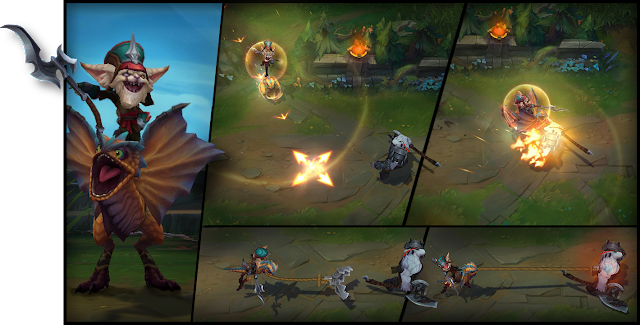 To remount Skaarl, Kled has to take risks and play aggressively—if he manages to earn back the lizard-critter's trust, he can ride back into battle renewed by his buddy's fresh health bar. In lane, Kled's strength fluctuates depending on whether Violent Tendencies is available. When it's up, the Cantankerous Cavalier can smash opponents with his empowered autos, but the ability goes on cooldown for a bit after it's activated, leaving Kled to depend on his other abilities to deal any meaningful DPS. Since Violent Tendencies can't be toggled on or off and activates as soon as Kled uses a basic attack, inexperienced Kled players will often find themselves frenzying all over a harmless minion wave, even when it would have been better to save the frenzy for a more threatening opponent. For this reason, Kled will want to carefully farm using his other abilities if he thinks he's likely to engage an enemy champion in the near future. If Kled goes "too HAM" (if there is such a thing) and Skaarl abandons him, he's got two options to get his buddy back: retreat back to base like a damned coward, or do as the voices in his head keep telling him and GO MORE HAM. Once Kled decides to go in for a trade, Jousting helps him stick to his target with ease. For trades that could go south, Kled will be able to just Joust back out after he's displayed his Violent Tendencies. If Kled goes "too HAM" (if there is such a thing) and Skaarl abandons him, he's got two options to get his buddy back: retreat back to base like a damned coward, or do as the voices in his head keep telling him and GO MORE HAM. If the Cantankerous Cavalier goes after an enemy champion, he'll have a limited supply of bullets in his Pocket Pistol to regain Skaarl's confidence and bring it galloping home to papa. If he's smart, Kled will closely watch Skaarl's courage bar and bait in opponents just as he remounts the yellow-bellied lizard to gain back his second health bar. With access to Jousting and Chaaaaaaaarge!!! restored, Kled'll be set to lock in the kill. Once laning phase ends, Kled contributes best to his team by acting as a skirmisher—he'll frenzy on any unlucky fool he can catch trespassing on his territory, using Jousting or Beartrap on a Rope to reposition or lock down dangerous opponents. Skaarl's extra health bar gives the Cantankerous Cavalier some tankiness, but it's relatively easy for an entire enemy team to focus down the lizard. If Skaarl abandons its post too early in a fight, Kled will be left stranded with little chance of survival. If Kled manages to hang onto his cowardly reptilian friend, though, he'll achieve his true potential as a single-target slayer. He can repeatedly slow and dash toward a lone, fleeing opponent using his Q and E, making him incredibly deadly on cleanup duty. You don't disengage from a fight with Kled whenever you want. You disengage from Kled when either he or you is dead. You don't disengage from a fight with Kled whenever you want. You disengage from Kled when either he or you is dead. Kled's single-target stickiness makes him great at responding to enemy split-pushes, since he can use his ultimate to blast into lane with a big ol' shield that'll boost his 1v1 duel potential. The speedboost effect left in Chaaaaaaaarge!!! 's wake lets him bring some friends along for the party as well. A well-timed Kled ult is the perfect way to force a teamfight—if you're grouped, your whole team can ride your slipstream and smash into the enemy frontline with you. But Chaaaaaaaarge!!! is also Kled's best (and nearly only) way of quickly moving onto an exposed flank. Of course, even Kled shouldn't go charging into battle against a whole army by himself. A little help from some friends might help him out. Kled may have two health bars, but he's hardly a tank. The Fae Sorceress's shields and buffs grant Kled the fortitude to go in on engages he'd normally be too squishy for, or, if he's been dismounted, to stay calm and keep frenzying. Kled's immobile allies aren't so immobile when they Chaaaaaaaarge!!! into battle with him. If the Might of Demacia lends his heart and sword to Kled, they'll both have the speed and strength to smash straight through the enemy frontline. Kled always has to make a choice once he's been knocked off his mount: stay in the fight to try and restore Skaarl's courage, or pack it in and recall to safety? With Kindred around, the choice is easy—Lamb's Respite gives Kled a free ticket to keep going HAM so he can remount his spineless critter and continue the battle stronger than before. It's tough for Kled and Skaarl to remain in the fray if they're up against an opponent with both crowd-control abilities and burst damage. If the Lady of Luminosity catches the yordle-lizard duo with a Light Binding, she may be able to Final Spark them to pieces before they can respond. The Yordle Gunner's late-game range will make an unmounted Kled think twice about hanging around teamfights, and both Rocket Jump and Buster Shotnegate one of the Cantankerous Cavalier's greatest strengths: sticking to his opponent. Next week we'll drop back in for some insights into Kled's development. In the meantime, chug some mushroom juice and head to the comments to share your thoughts on the Cantankerous Cavalier." KLED is headed to the PBE in the 6.16 PBE cycle- check out the 7/25 post for more info!